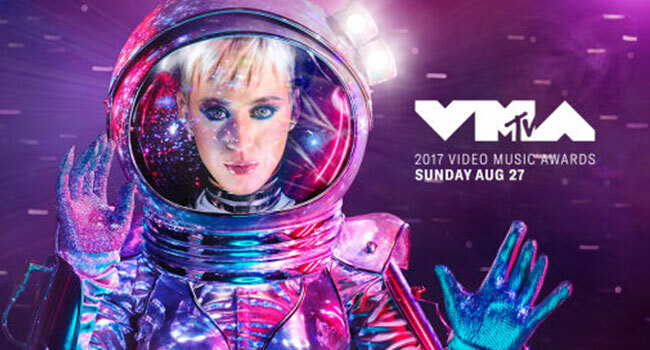 Katy Perry will host the 2017 MTV Video Music Awards live from the “Fabulous” Forum in Inglewood, CA on Sunday, August 27th at 8 pm ET/PT. In advance of the world tour for her most recent, chart-topping album, Witness, Perry will light up the stage as the first performer announced for this year’s show. She has also secured a spot as one of the top nominees for the 2017 VMAs with nods in five categories, including: Best Pop, Best Direction and Best Visual Effects for “Chained to the Rhythm,” Best Art Direction for “Bon Appetit,” and Best Collaboration for Calvin Harris’ “Feels” featuring Pharrell Williams, Perry and Big Sean. MTV has released the full list of nominees for the 2017 MTV Video Music Awards in a first ever Instagram live collaboration between an elite squad of nine Instagram stars. The announcement revealed Kendrick Lamar leading the pack with eight nominations for his video “HUMBLE.” Katy Perry and The Weeknd are tied with five nominations each, following closely behind is Bruno Mars and DJ Khaled tied with four, and Ed Sheeran and Alessia Cara tied with three nominations each. Performers and presenters will be announced at a later date. Fans can vote for their favorites across eight VMA categories, including “Video of the Year,” “Artist of the Year,” “Best Collaboration” and more by visiting vma.mtv.com. Additionally, voting for the “Best New Artist” award, presented by Taco Bell, will remain live through the 2017 MTV Video Music Awards Pre-Show airing at 7 pm ET/PT. The top two artists will be revealed during the pre-show, kicking off a live Twitter hashtag vote with the winner being announced during the live main telecast. Nominees for the socially voted category, “Best Song of Summer,” will be announced at a later date.